Monocyte-derived dendritic cells (MDDCs) activate naive T lymphocytes to induce adaptive immunity, effecting Th1 polarization through IL-12. However, little is known about other potential DC Th1 polarizing mechanisms, or how T cell polarization may be affected by DCs differentiating in, or exposed to, a proinflammatory environment. Macrophages (MΦs) are DC precursors abundant in inflamed tissues, lymph nodes, and tumors. Thus we studied the T cell-activating and -polarizing properties of MΦ-derived DCs (ΦDCs). Monocytes were cultured in MΦ-CSF (M-CSF) to produce MΦs, which were then differentiated into DCs following culture with GM-CSF plus IL-4. ΦDCs activated a significant allogeneic MLR and were significantly better than MDDCs in activating T cells with superantigen. Most strikingly, ΦDCs elicited up to 9-fold more IFN-γ from naive or Ag-specific T cells compared with MDDCs (with equivalent IL-4 secretion), despite producing up to 9-fold less IL-12. Neutralization of MDDC, but not ΦDC IL-12 significantly inhibited T cell IFN-γ induction. ΦDCs produced up to 12-fold more β-chemokines (macrophage-inflammatory protein-1α, -1β, and RANTES) than MDDCs. Ab blockade of CCR5, but not CXC chemokine receptor 4, inhibited T cell IFN-γ induction by ΦDCs significantly greater than by MDDCs. Thus DCs differentiating from MΦs induce T cell IFN-γ through β-chemokines with little or no requirement for IL-12. Myeloid DCs arising from distinct precursor cells may have differing properties, including different mechanisms of Th1 polarization. These data are the first reports of IFN-γ induction through chemokines by DCs. Monocytes are peripherally circulating myeloid dendritic cell (DC)3 precursor cells. In vitro they differentiate into monocyte-derived dendritic cells (MDDCs) following culture with GM-CSF plus IL-4 (1). However, myeloid differentiation is complex, not fully understood, and subject to external influences (2, 3, 4). Monocytes cultured with macrophage colony-stimulating factor (M-CSF) differentiate into macrophages (MΦs), and these MΦs will differentiate into DCs upon withdrawal of M-CSF followed by further culture with GM-CSF plus IL-4 (5, 6). Monocytes reverse transmigrating across endothelial barriers differentiate into DCs in the absence of exogenous cytokines (7). Collectively, these myeloid DCs may be referred to as DC1s (8), although this designation generally relates to MDDCs. Factors impinging upon DC1s during their differentiation may influence the functional phenotype of the differentiated DCs. For example, monocytes exposed to PGE2 will differentiate into DCs in the presence of GM-CSF plus IL-4 and mature into CD1a+CD83+ DCs, but are impaired in IL-12 secretion. Exposure to IL-10 inhibits both maturation and IL-12 production (9). Addition of type I IFNs to monocytes differentiating in the presence of GM-CSF plus IL-4 significantly impairs their ability to differentiate into IL-12-secreting, IFN-γ-inducing DCs (10, 11). In contrast, monocytes cultured in GM-CSF plus IFN-α secrete more IL-12 compared with MDDCs generated with GM-CSF plus IL-4, resulting in significantly better T cell IFN-γ induction (12). Thus, MDDCs are generally considered to be Th1 polarizing, and mediate this effect through secretion of IL-12. Although monocytes differentiating into MDDCs in the presence of PGE2 induce Th2-polarized immunity (13), MDDC Th1 polarization in the absence of IL-12 has not previously been reported. Plasmacytoid DCs (referred to as DC2s; Ref. 8) are distinct from myeloid DCs and may be Th0 or Th2 polarizing when freshly isolated from blood, stimulating T cell IL-4 and other cytokines, but little or no IFN-γ (8, 14). However, following viral infection of plasmacytoid DCs, they induce T cells to produce IFN-γ (simultaneous with IL-10 in some cases) with little or no IL-4 production (15). Thus T cell activation by DCs varies according to the type of signals present at the time of activation. Furthermore, all prior work has examined the effects of different signals on the same precursor cell: monocytes in the case of DC1s and pDC2s in the case of DC2s. The effects on DC differentiation of different DC precursor cells have been little studied in the context of both DC1s and DC2s. We considered that DC differentiation under local conditions of infection, inflammation, or tumor might differ from steady-state DC differentiation owing to different precursor cells of origin, in addition to local factors. Thus we studied MΦs as the model local DC1 precursor cell, as they are abundant in inflamed tissues, tumors, and lymph nodes, and compared them to MDDCs as the model steady-state DC1. We now show that compared with MDDCs, ΦDCs are significantly more efficient in activating T cells, express a distinct pattern of T cell costimulatory molecules and Ag capture receptors, and are significantly more efficient at pinocytosis. Most strikingly, ΦDCs induce T lymphocyte IFN-γ secretion through a mechanism that involves β-chemokines with little or no dependence on IL-12. Induced T cell IL-4 secretion is equivalent to MDDCs, demonstrating a Th1-polarizing effect. Thus DCs may use distinct Th1-polarizing mechanisms depending on the precursor cell of origin, which in turn may be influenced by the local microenvironment. These studies were approved by the Institutional Review Board of Baylor University Medical Center. Subjects gave written informed consent for study. Toxoplasma gondii Ab testing of serum was performed in a commercial laboratory. Recombinant human IL-2 was the generous gift of Hoffman-LaRoche (Nutley, NJ). All other recombinant human cytokines were purchased from R&D Systems (Minneapolis, MN). PBMCs were obtained by Ficoll-Hypaque (Amersham Pharmacia Biotech, Uppsala, Sweden) density gradient centrifugation of either heparinized peripheral blood obtained by phlebotomy, or from leukopheresis products obtained without cytokine-induced mobilization of precursor cells, and were frozen at −86°C until use. PBMCs were adhered to plastic plates (Costar, Corning, NY) for 2 h in RPMI 1640 medium (Life Technologies, Grand Island, NY) supplemented with 10% heat-inactivated FCS (Life Technologies), 10 mM HEPES buffer, 2 mM l-glutamine, and antibiotics. Nonadherent cells were gently rinsed away and frozen for later use as a source of responder T cells. MΦs were produced by culture of adherent PBMCs in 25 ng/ml M-CSF for 4–7 days. M-CSF was replaced every 2 or 3 days. Immature MDDCs were produced by culturing adherent PBMCs in medium containing 25 ng/ml GM-CSF plus 5 ng/ml IL-4 and used on days 5–7 of culture. Fresh cytokines were replaced every 2 or 3 days. To differentiate DCs from MΦs, after 4–7 days of culture of monocytes in M-CSF, medium with M-CSF was removed, cells were washed, and medium with 25 ng/ml GM-CSF plus 5 ng/ml IL-4 was added. IL-13 (5 ng/ml) replaced IL-4 where indicated. Cells were cultured an additional 4–9 days as indicated before use. CD1a-expressing cells were positively selected using goat anti-mouse mAb-coated Miltenyi superparamagnetic microbeads (Miltenyi Biotec, Auburn, CA) coupled to murine anti-human CD1a mAb (BioSource International, Camarillo, CA) according to the manufacturer’s suggestions. ΦDCs and MDDCs were matured by 2 days of incubation with 1 μg/ml Escherichia coli LPS (Sigma, St. Louis, MO), 200 ng/ml recombinant soluble CD40 ligand (CD40L; Immunex, Seattle, WA), or a combination of 10 ng/ml TNF-α plus 10 ng/ml IL-1β. Cells were counted by light microscopy in hemacytometer chambers using trypan blue dye. Cytospin slides were prepared by centrifuging 50,000 cells onto glass microscope slides. These were dried, fixed with methanol, stained with Giemsa stain, and visualized by light microscopy. Ag-specific polyclonal T cell lines were generated from T. gondii-seropositive subjects by repeated stimulation of PBMCs with Ag as we previously described (16, 17), except that autologous MDDCs were substituted for PBMCs as the APC. 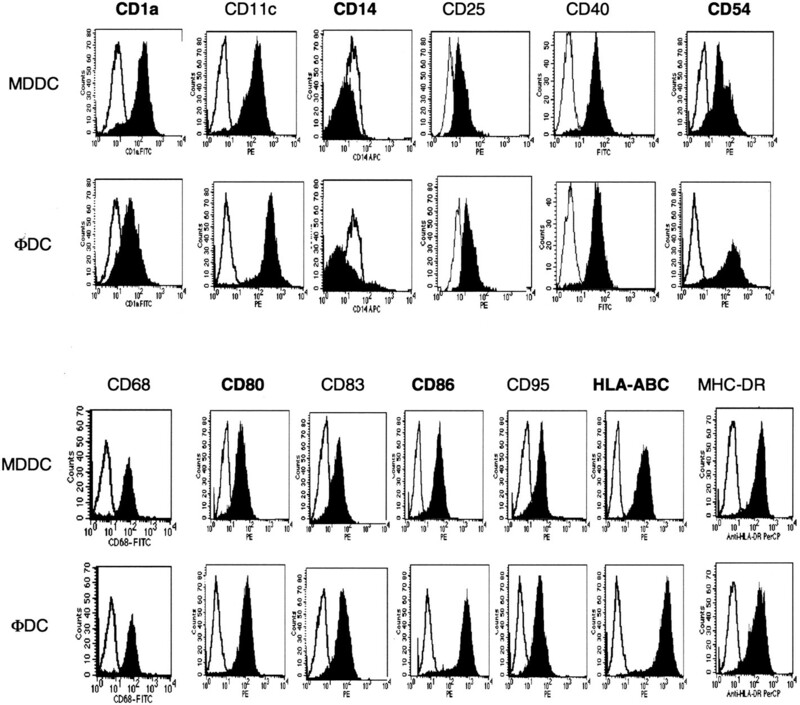 At the time of assays, these polyclonal cultures were comprised of ≥99% CD3+ T lymphocytes, which were a mixed population of both CD4+ and CD8+ cells by FACS analysis. The specific Ags used were heat inactivated (56°C for 2 h) T. gondii tachyzoites (maintained in human foreskin fibroblasts as described; Ref. 16) or tetanus toxoid (Massachusetts State Board of Health, Jamaica Plain, MA). The Ag specificity of these polyclonal cultures was confirmed by incubation with Ag-charged, autologous MDDCs. T cell cultures were maintained in recombinant human IL-2 at 5–10 U/ml and were used in functional assays 7–10 days following their last stimulation with Ag. Purified CD4+CD45RA+ naive T cells were obtained from adult PBMCs using Miltenyi paramagnetic microbeads. In all comparisons between ΦDCs and MDDCs reported herein, cells were generated from the same donor and assayed at the same time under identical conditions, meaning that in some cases cultures were initiated at different times. T cell proliferation assays were performed in 200 μl total volume in 96-well round-bottom plastic tissue culture plates (Costar) using autologous or allogeneic CD4+CD45RA+ naive T lymphocytes or Ag-specific polyclonal T cell lines. Staphylococcus aureus enterotoxin B (SEB; Sigma) was used at a final concentration of 10 ng/ml, and tetanus toxoid was used at 4 U/ml. 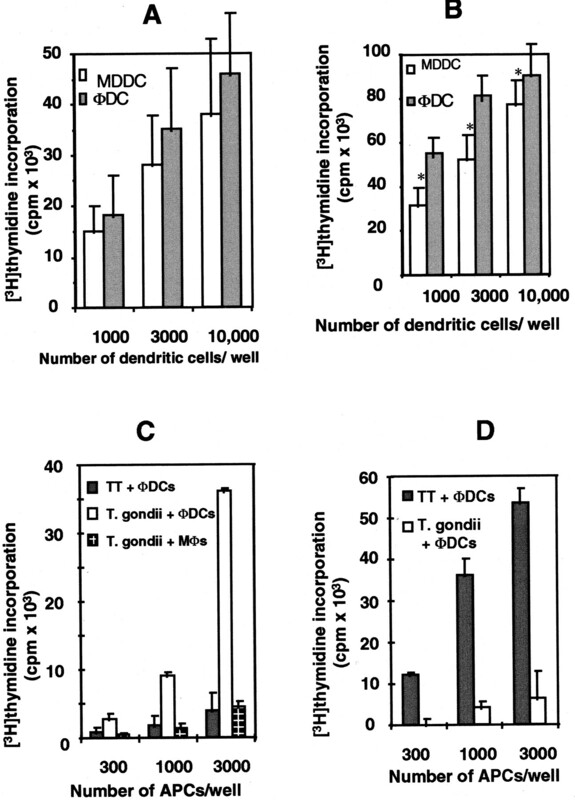 T. gondii tachyzoites were used at 10 per ΦDC or MDDC. ΦDCs or MDDCs were incubated with Ag overnight before coculture with responder T cells. [3H]methylthymidine (1 μCi; New England Nuclear, Boston, MA) was added during the final 8 h of incubation, which was 3 days for SEB and 5 days for other stimuli, and the mean ± SD of triplicate determinations is reported. Murine polyclonal neutralizing Abs to IL-12 (R&D Systems) were added at the time of coculture of DCs and T lymphocytes, at a final concentration of 10 μg/ml. Murine blocking Abs to CXC chemokine receptor (CXCR) 4 or CCR5 (PharMingen, San Diego, CA) were added to T lymphocytes 8 h before they were added to DCs, at a final concentration of 10 μg/ml. CTL were elicited by incubating ΦDCs with autologous, irradiated (6000 rads from a γ source) EBV-transformed B lymphocytes overnight, followed by addition to autologous PBMCs at a 1:100 ratio in RPMI 1640 medium supplemented with 10% heat-inactivated FCS, HEPES buffer, glutamine, and antibiotics. Cytolytic activity was assessed 10 days later against autologous and allogeneic 51Cr-labeled EBV-transformed B lymphocytes as described (16, 18). To assess pinocytosis, 1 × 105 cells were suspended in 100 μl of medium and incubated 1 h with FITC-dextran (final concentration 200 μg/ml; Molecular Probes, Eugene, OR) at 37°C in a water bath, or at 4°C on ice. Cells were then washed in PBS without calcium or magnesium plus 5 mM EDTA and 2% FCS. FITC-dextran uptake was assessed by FACS. Dead cells were excluded from the analysis gate by the addition of propidium iodide (Sigma) at 4°C 2 min before data acquisition. Data were acquired on a FACScan (Becton Dickinson, Mountain View, CA) and analyzed with CellQuest software (Becton Dickinson). At least 5000 gated events were evaluated for each condition. To determine cytokine or chemokine production by MDDCs or ΦDCs, supernatants were collected from immature ΦDCs or MDDCs activated with CD40L, LPS, or IL-1β plus TNF-α, maintained at a uniform density of 200,000 cells/ml, and frozen at −86°C before analysis. Cytokine or chemokine concentration was determined by ELISA using commercial kits (R&D Systems) according to the manufacturer’s suggestions. The IL-12 ELISA kit we used detects biologically active p70. To assess cytokine secretion by T cells following activation by MDDCs or ΦDCs, T cells and DCs were cocultured at a 5–50:1 ratio, and supernatants were collected 3 days later, frozen until use, and analyzed by ELISA as described above. To detect in situ cytokine production, mature ΦDCs or MDDCs were charged with 10 ng/ml SEB or specific Ag, and cocultured with autologous CD4+CD45RA+ naive autologous T cells or Ag-specific autologous polyclonal T cell lines, respectively, for 3 days. T cells were then stimulated with 50 ng/ml PMA (Sigma) plus 500 ng/ml ionomycin (Sigma) for 6 h. Monensin (2 μM; Sigma) was added during the final 2 h. Cells were then stained with murine mAbs against CD4 (FITC-labeled), CD8 (PE-labeled), and CD3 (peridinin chlorophyll protein-labeled), fixed with 1% paraformaldehyde in PBS, or permeabilized, and stained with murine mAbs detecting IL-2 (APC-labeled), IL-4 (FITC-labeled), or IFN-γ (PE-labeled). Stained cells were analyzed by FACS as described above, counting at least 8000 gated events per condition. mAbs were purchased from BioSource International (CD1a), Becton Dickinson (CD3, CD4, CD8, CD11c, CD19, CD25, CD45RO, CD45RA, CD80, MHC class I molecule (DR)), Caltag (Burlingame, CA) (CD14), PharMingen (CD36, CD40, CD51/61, CD86, CD95, HLA A,B,C, αvβ3, IL-2, IL-4, IFN-γ), Immunotech (Miami, FL) (CD54, CD83), and Dako (Glostrup, Denmark) (CD68). Cells were stained according to the manufacturer’s suggestions and then fixed in paraformaldehyde 1% in PBS. Data were acquired and analyzed as described above, counting at least 5000 cells per condition. Appropriate cell and mAb isotypic controls were included in each analysis, with acquisition and analysis gates set accordingly. Differences between groups were compared by Student’s two-tailed paired or unpaired t test as appropriate, assuming equal variances. Values of p < 0.05 were considered significant. 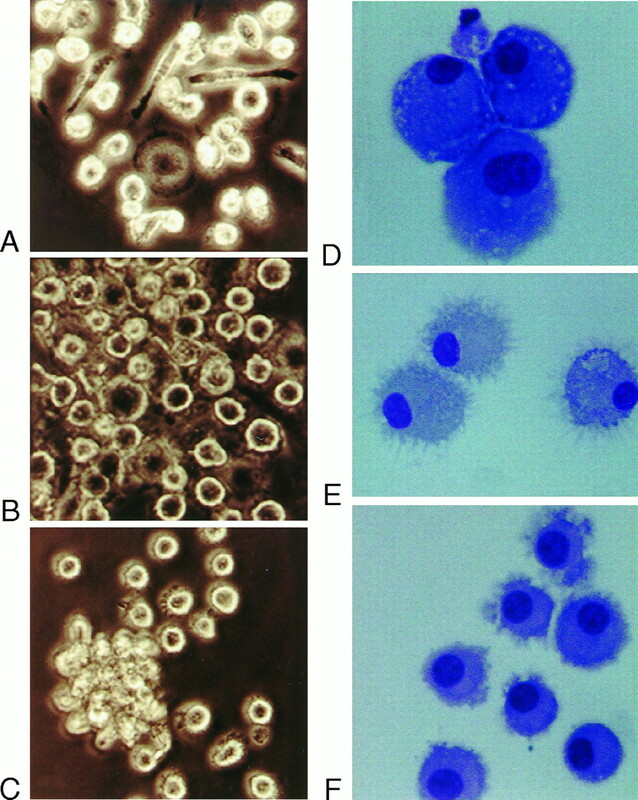 Monocytes cultured with M-CSF differentiated into typical MΦs (Fig. 1⇓, A and D). Forty to fifty percent of these MΦs became nonadherent cells morphologically similar to MDDCs in that dendrites were present by days 4–7 of culture in GM-CSF plus IL-4, in agreement with previous work (5). MDDCs comprised a uniform population of nonadherent cells, whereas ΦDC cultures were comprised of an adherent monolayer interspersed with occasional adherent cell clumps and a detached, nonadherent population (Fig. 1⇓, B and C). MΦs in parallel cultures are shown for comparison (Fig. 1⇓A). By days 7–9 of culture in GM-CSF plus IL-4, matured nonadherent ΦDCs were larger, more spherical, and had more abundant cytoplasm by Giemsa staining and had longer, finer dendrites compared with MDDCs produced in parallel cultures (Fig. 1⇓, E and F). Because these MΦ-derived cells have DC morphologic characteristics, express CD1a, CD80, CD86, CD83 (upon maturation), and DR, and elicit a significant allogeneic MLR (see sections on activation of naive T cells), they are clearly DCs. We term these MΦ-derived DCs “ΦDCs” (pronounced “phi DCs”) to denote their MΦ origin. Photomicrographs of MΦs (A and D), ΦDCs (B and E), and MDDCs (C and F) in culture. A–C, Light microscopic images of live cells in culture by inverted phase microscopy on day 6. D–F, Giemsa-stained cells from the same cultures following preparation on a cytospin slide. MDDCs and ΦDCs for the photographs (D–F) were the nonadherent fraction following two additional days of culture (8 days total) with E. coli LPS to induce maturation. Adherent day 8 MΦs were removed following treatment with trypsin. Original magnification ×200 for inverted phase microscopy and ×400 for Giemsa-stained cells. Nonadherent cells in cultures of MΦs from days 6–9 in GM-CSF plus IL-4 were a heterogeneous population of cells, variably 40–70% CD1a+ and 30–60% CD1a−. The nonadherent cells in the culture were referred to as immature ΦDCs. For FACS analyses, data were collected on cells gated for CD1a expression. For MLR and other analyses, CD1a+ cells were purified (>90% purity) from the immature population using Miltenyi paramagnetic microbeads. These immature ΦDCs expressed up to 9-fold more CD14 than immature MDDCs (Table I⇓). Further culture in GM-CSF plus IL-4 beyond 9 days did not result in additional nonadherent ΦDC formation, decreased CD14 expression, or increased CD1a expression. Thus immature ΦDCs were studied between days 6 and 8 of culture in GM-CSF plus IL-4 (days 10–13 of total culture). Under these conditions, 40–70% of input MΦs differentiated into nonadherent ΦDCs. Substitution of IL-13 for IL-4 effected comparable differentiation of MΦs into DCs, and culture of MΦs in GM-CSF alone or with TNF-α, but without IL-4, did not effect ΦDC differentiation (data not shown). The adherent cells in these cultures morphologically resembled MΦs, were CD1alo/−CD14+DRlo by FACS, and were significantly less efficient than nonadherent cells in eliciting an allogeneic MLR. Following maturation with either LPS, CD40L, or TNF-α plus IL-1β this nonadherent heterogeneous cell population became fairly uniform and expressed levels of CD4, CD11c, CD25, CD40, CD51/61, CD68, CD83, CD95, and DR comparable to mature MDDCs (Fig. 2⇓). Whereas 95–100% of both mature ΦDCs and MDDCs were CD1a+, ΦDCs expressed a mean 0.5 log10 lower intensity of CD1a. 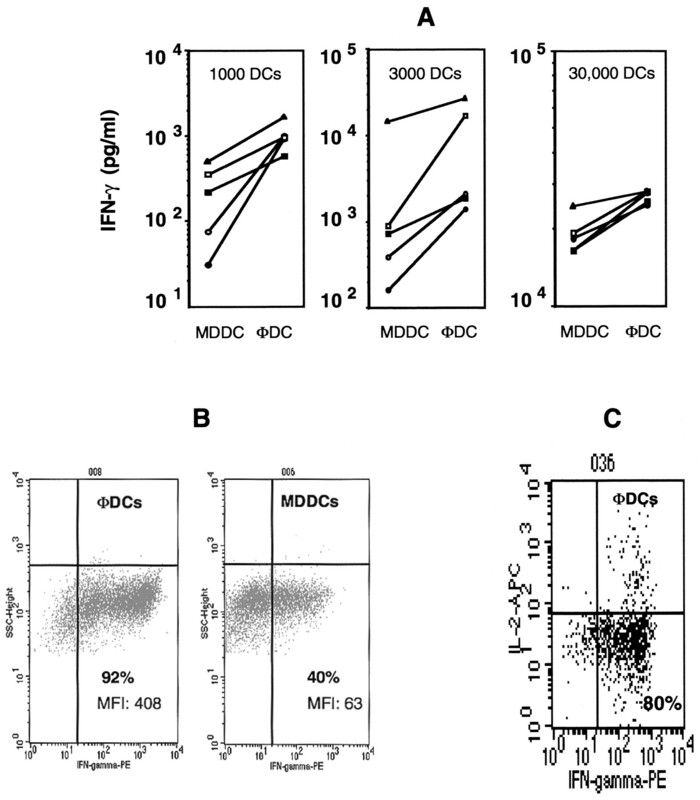 ΦDCs expressed significantly higher levels (3- to 10-fold more) of the T cell costimulatory molecules CD54, CD80, CD86, and MHC class I than MDDCs (Fig. 2⇓). As the cultures of mature ΦDCs were almost devoid of CD1a−CD14+ cells that were likely MΦs, all additional experimental work was performed on mature ΦDCs, except for analysis of FITC-dextran uptake as noted. Comparison of the FACS profiles of LPS-matured MDDCs or ΦDCs. Both MDDCs and ΦDCs were cultured for 6 days in GM-CSF plus IL-4, and maturation was then induced by two additional days of culture following addition of 1 μg/ml E. coli LPS. Legends in bold represent molecules expressed at significantly different intensities (p < 0.05) by mature ΦDCs compared with mature MDDCs. CD14, CD54, CD80, CD86, and MHC class I (HLA-ABC) were all expressed at significantly higher intensities by ΦDCs compared with MDDCs. Although 95–100% of MDDCs and ΦDCs expressed CD1a, ΦDCs expressed a mean 0.5 log10 lower intensity of staining (p < 0.05), and 10–25% continued to coexpress CD14. Expression of CD4 and CD51/61 is not shown here, but was equivalent between MDDCs and ΦDCs. Data shown were derived from cells obtained from a single donor and are representative of similar studies of five individuals with similar results. The apoptotic body/Ag capture receptors CD14, CD36, and αvβ3 were expressed on a significantly higher proportion of ΦDCs compared with MDDCs. αvβ5 expression on MDDCs and ΦDCs was similar. For these experiments, maturation was induced by incubation with LPS only. Results are shown in Table I⇑. Immature ΦDCs and MDDCs both down-regulated CD14, CD36, and αvβ5 following maturation with LPS, although baseline expression and degree of change in expression following maturation differed considerably between MDDCs and ΦDCs. Immature ΦDCs expressed almost twice as much CD36 as immature MDDCs, although both down-regulated this receptor to equivalent levels following maturation. αvβ5 expression by immature and mature MDDCs and ΦDCs was similar and high. Mature ΦDCs expressed significantly (8.5-fold) more αvβ3 than mature MDDCs. Ten to 25% (mean 14%) of ΦDCs remained dually CD1a+CD14+ following maturation with LPS, which is 4- to 10-fold higher than MDDCs (Table I⇑, and data not shown). ΦDCs matured with LPS effected significant proliferation of naive CD4+CD45RA+ T cells in an allogeneic MLR, which was significantly stronger than control MΦs as expected and comparable to that elicited by mature MDDCs (Fig. 3⇓A). Similar results were obtained when ΦDCs were matured with soluble, recombinant CD40L or with the combination of TNF-α plus IL-1-β (data not shown). T cell activation by MDDCs compared with ΦDCs. In all of the experiments shown, cultures were staggered so that MDDCs were compared with autologous ΦDCs on the same day using the same responder cells. A, Induction of an allogeneic MLR was equivalent using MDDCs or ΦDCs. LPS-matured MDDCs or ΦDCs were incubated with 50,000 CD4+CD45RA+ naive, allogeneic T cells for 4 days, and 1 μCi [3H]methylthymidine was added during the final 8 h. Results are expressed as the mean ± SD of triplicate determinations. One representative experiment of >15 from five individuals is shown. B, ΦDCs incubated with the superantigen SEB consistently induced significantly more naive T cell activation as measured by [3H]methylthymidine incorporation compared with autologous MDDCs. Experiments were set up as described above except that autologous T cells were used and MDDCs or ΦDCs were added together with 10 ng/ml SEB. One representative experiment of >15 from five individuals is shown. Significantly greater T cell proliferation was effected by ΦDCs compared with MDDCs at all three DC:T cell ratios studied in all five subjects studied. ∗, # Values of p are <0.05 for each of the determinations shown here. C, T. gondii-specific T cell line. D, TT-specific T cell line. C and D, ΦDCs present specific Ag to T cells. Autologous ΦDCs were charged with Ag, matured with LPS, and incubated with polyclonal T cell cultures for 5 days. T cell proliferation was determined by [3H]methylthymidine incorporation as described. One representative experiment of three is shown. LPS-matured ΦDCs induced superantigen-mediated autologous T cell proliferation significantly better than MDDCs as measured by T cell proliferation (Fig. 3⇑B) and cytokine production (see below). Both ΦDCs and MDDCs were significantly more potent than MΦs in eliciting allogeneic and autologous T cell activation as expected (maximum MΦ-induced proliferation was <2000 cpm in an allogeneic MLR and <4000 cpm for presentation of SEB). Immature day 6 ΦDCs were incubated overnight with tetanus toxoid or with T. gondii tachyzoites, matured with LPS, and cultured with autologous, polyclonal Ag-specific T cells. Mature ΦDCs were significant activators of Ag-specific T cells as measured by T cell proliferation (Fig. 3⇑, C and D) and cytokine production (see below). These data also confirm the Ag specificity of these polyclonal T cell lines. Baseline secretion of IL-10 or IL-12 p70 was undetectable by ELISA in MDDCs and ΦDCs. MDDCs or ΦDCs were matured by incubation for 2 days with recombinant, soluble CD40L, LPS, or IL-1β plus TNF-α. Following maturation, ΦDCs produced levels of IL-10 that were comparable to those produced by MDDCs, but produced up to 9-fold less IL-12 p70, no matter which of the three activation signals was used (Table II⇓). LPS-matured ΦDCs incubated with SEB induced significantly more IFN-γ secretion from autologous CD4+CD45RA+ T cells than did MDDCs (Fig. 4⇓A). To determine whether this strong Th1-polarizing influence also occurred in an Ag-specific manner, we used ΦDCs expressing either tetanus toxoid or T. gondii Ags. By in situ cytokine detection, a significantly greater proportion of T cells expressed IFN-γ in response to coculture with Ag-expressing ΦDCs compared with Ag-expressing MDDCs (77 ± 15% vs 37 ± 8%; p < 0.001) (representative data in Fig. 4⇓B). ΦDCs also elicited significantly more T cell IL-2 than MDDCs (20 ± 5% vs 12 ± 3%; p < 0.05). Elicited T cell IL-4 was equivalent and <5% using either ΦDCs or MDDCs. Data here are the mean ± SD of three independent experiments. Similar results were obtained using SEB stimulation of autologous naive CD4+CD45RA+ T cells, and in an allogeneic MLR (data not shown). ΦDCs elicit significantly more (up to 9-fold) T cell IFN-γ secretion and induce a significantly greater proportion of T cells to produce IFN-γ compared with MDDCs. A, Naive CD4+CD45RA+ T cells were induced to express cytokines using SEB presented either on autologous MDDCs or ΦDCs. Supernatants were assayed for IFN-γ secretion by ELISA 4 days later. Each symbol connected by a line represents the same donor assayed at the same time, demonstrating the consistency of this observation. B, ΦDCs or MDDCs were incubated with T. gondii Ags and matured for 2 days with LPS before culture with an autologous T. gondii-specific T cell line. In this experiment, the cell line contained ∼70% CD4+ T cells and 30% CD8+ T cells. A single experiment representative of three similar experiments with similar results is shown. C, ΦDCs elicit IFN-γ secretion from CD8+ T lymphocytes in an Ag-specific manner. Autologous ΦDCs were loaded with T. gondii Ags and used to elicit IFN-γ production from autologous, polyclonal T. gondii-specific CD8+ T lymphocytes. IFN-γ production using autologous ΦDCs loaded with irrelevant TT Ag was <20%. One experiment representative of two is shown. Although we were primarily interested in evaluating the effects of ΦDCs on CD4+ T lymphocytes, we also asked whether ΦDCs could activate Ag-specific CD8+ T lymphocytes. ΦDCs elicited up to 26% specific cytotoxicity against autologous EBV-transformed B lymphocytes in polyclonal T cell cultures at an E:T ratio of 60:1, and induced IFN-γ secretion in autologous polyclonal cultures of T. gondii-specific CD8+ T lymphocytes in an Ag-specific manner (Fig. 4⇑C). To assess for factors inducing T lymphocyte IFN-γ secretion, T. gondii Ag-charged ΦDCs or MDDCs were incubated with autologous polyclonal cultures of T. gondii-specific T lymphocytes. Addition of anti-IL-12-neutralizing Ab significantly diminished T cell IFN-γ induction by MDDCs as expected, whereas there was no significant effect on induction of T cell IFN-γ by ΦDCs (Fig. 5⇓A). 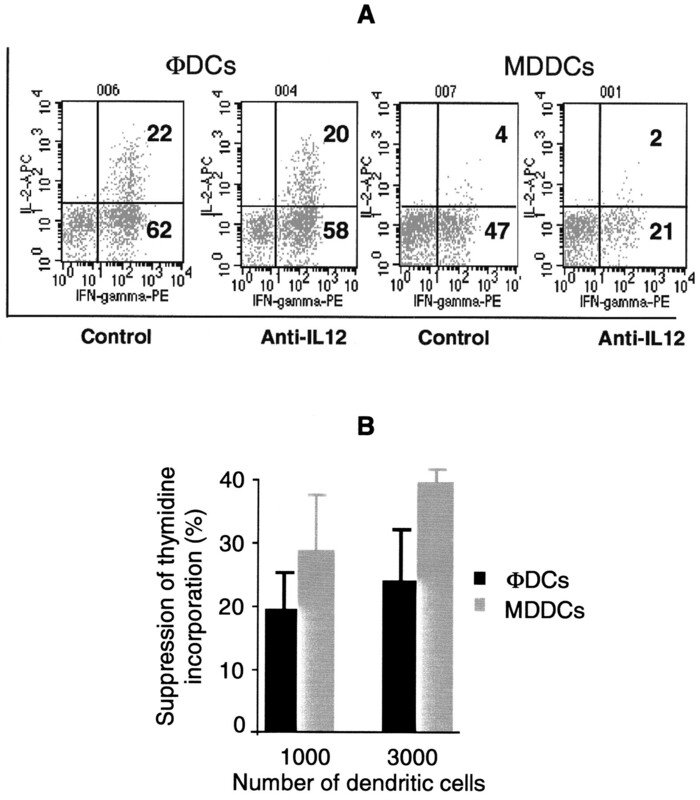 Anti-IL-12-neutralizing Ab also diminished T cell proliferation mediated by both ΦDCs and MDDCs, although there was significantly more diminution with MDDCs (Fig. 5⇓B). Neutralization of IL-12 with a polyclonal Ab inhibits MDDC, but not ΦDC-induced T cell IFN-γ production. A, Numbers within the quadrants are the percentages of cells in that quadrant. A single experiment representative of three is shown. B, Neutralizing anti-IL-12 Ab reduced T lymphocyte proliferation elicited by either ΦDCs or MDDcs in an allogeneic MLR. However, suppression of MDDC-mediated T lymphocyte proliferation was significantly greater (p < 0.01 compared with ΦDCs). As β-chemokines may be Th1 polarizing (19, 20, 21, 22, 23, 24) and may be produced by DCs (25, 26, 27), we determined the relative secretion of β-chemokines by ΦDCs and MDDCs by ELISA of cell culture supernatants following their maturation with LPS. ΦDCs secreted a mean of up to 12-fold more macrophage-inflammatory protein (MIP)-1α, -1β, and RANTES compared with MDDCs (Fig. 6⇓A). 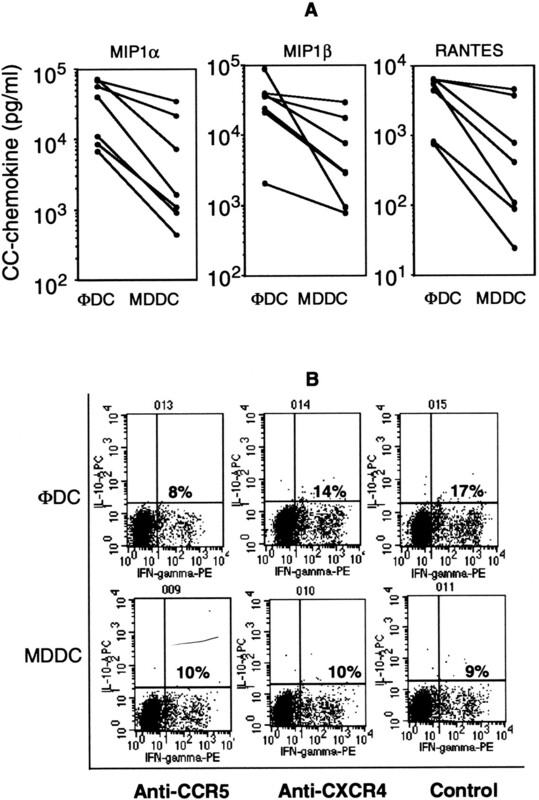 In addition to the higher mean production of β-chemokines between ΦDCs and MDDCs, ΦDCs of each individual secreted more β-chemokines compared with autologous MDDCs, demonstrating a consistent effect from subject to subject. ΦDCs secrete up to 12-fold more of the β-chemokines MIP-1α, MIP-1β, and RANTES compared with MDDCs following maturation with E. coli LPS. A, β-chemokine concentrations in culture supernatants after 2 days. Lines connect autologous MDDCs to ΦDCs, demonstrating consistently higher β-chemokine production in each individual subject studied using ΦDCs (n = 7). B, Blockade of T lymphocyte CCR5, but not CXCR4, significantly reduced (p < 0.05) ΦDC-mediated IFN-γ induction in an allogeneic MLR comparing anti-CCR5 to control (without Abs). One experiment representative of three is shown. To confirm the role of β-chemokines in T cell IFN-γ induction, we assessed the effect of a blocking Ab against the β-chemokine receptor CCR5. CCR5 blockade inhibited ΦDC-mediated T cell IFN-γ induction by up to 50% (p < 0.01), whereas blocking Ab against the CXCR4 had no significant effect (Fig. 6⇑B). Anti-CCR5 (but not anti-CXCR4) blocking Ab slightly reduced MDDC-mediated T cell IFN-γ production, but to a significantly lesser extent than that observed with ΦDCs (Fig. 6⇑B, and data not shown). 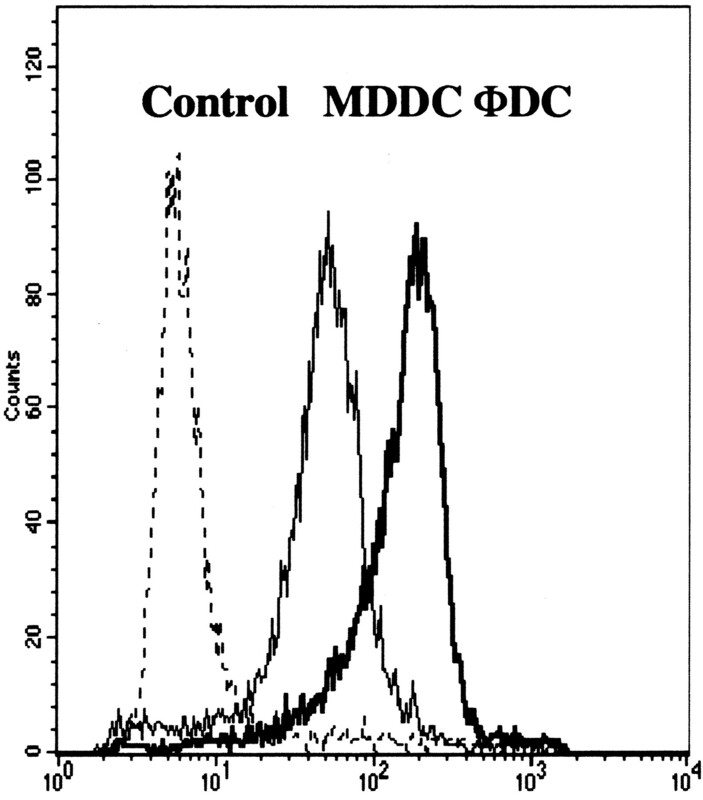 Cells in cultures of immature ΦDCs effected significantly more pinocytosis of FITC-dextran than MDDCs or MΦs, displaying a 0.5 log10 higher mean fluorescence intensity (n = 5; p < 0.05) following ingestion of FITC-dextran (representative data are shown in Fig. 7⇓). Following maturation, ΦDCs and MDDCs were equally poor in pinocytosing FITC-dextran, consistent with a mature DC functional phenotype. FITC-dextran uptake mediated by immature ΦDCs is significantly greater than that effected by MDDCs. One hundred thousand ΦDCs or MDDCs were incubated with 200 μg/ml FITC-dextran for 1 h. Uptake at 37°C was compared with uptake at 4°C (control). MΦ pinocytosis of FITC-dextran was significantly lower than MDDCs or ΦDCs (data not shown). One experiment representative of 10 is shown. Much prior work has focused on the phenotype and function of DC1s differentiated from resting monocytes because large numbers of relatively homogenous cells are easily produced (1, 28). However, other myeloid cells also differentiate into DC1s (2, 5, 6, 29), although whether these DCs are functionally distinct is not well studied. In particular, T cell activation and mechanisms of Th1 polarization by DC1s differentiating under other than resting conditions have been little studied. We considered MΦs to be ideal DC precursor cells for this work, as they are abundant at sites of inflammation, infection, and tumors. We termed DCs differentiating from MΦs “ΦDCs” to denote their MΦ origin. We first demonstrated that ΦDCs and MDDCs both expressed equivalent amounts of the myeloid differentiation marker CD11c as well as other molecules typically associated with DC1s including CD1a, CD4, CD83 (following maturation), and HLA DR. However, ΦDCs expressed significantly higher levels of T cell activation molecules and apoptotic body/Ag capture receptors than MDDCs, suggesting that they are specialized to be efficient in Ag capture and subsequent T cell activation. This phenotype translated into significantly more efficient activation of T cells compared with MDDCs following presentation of superantigen to naive T lymphocytes, or specific Ag to Ag-specific autologous T lymphocytes. To what extent the enhanced expression of T cell costimulatory molecules contributes to efficient T cell activation is not completely defined. However, as activation of an allogeneic MLR was equivalent by either MDDCs or ΦDCs, additional factors are likely to be involved. Immature MDDCs express a variety of Ag capture receptors including CD14, CD36, αvβ3, and αvβ5, which are all involved in the capture of apoptotic bodies (30, 31, 32). These are typically down-regulated upon MDDC maturation at the same time as the immature MDDC loses its ability to acquire Ag and up-regulates its ability to present acquired Ag to T cells (28). Most of these well-characterized Ag capture receptors were expressed at significantly higher levels on ΦDCs compared with MDDCs. However, the specific functional consequences have not yet been defined. The continued expression of CD14 on a subpopulation of matured ΦDCs may reflect their lack of complete differentiation in these cultures. As expected, immature ΦDCs were avidly pinocytotic of FITC-dextran but lost this capacity following maturation, a functional DC hallmark. Unexpectedly, ΦDCs pinocytosed significantly more FITC-dextran than MDDCs. Efficient pinocytosis by ΦDCs may be due to their larger size, more efficient pinocytosis, or a combination of factors. Enhanced pinocytosis may make ΦDCs highly proficient at capturing soluble Ags compared with MDDCs. In addition to activation of naive CD4+ T lymphocytes, DCs also activate CD8+ T lymphocytes. ΦDCs induced Ag-specific CTLs as assessed by Ag-specific target cell cytotoxicity, and induced IFN-γ-producing CD8+ T lymphocytes following Ag-specific activation. To investigate activation of T cells further, we studied biologically active IL-12 p70 secretion by ΦDCs and MDDCs. Despite culture with optimal amounts of three different agents known to induce IL-12 secretion from DCs, ΦDCs produced up to 9-fold less IL-12 p70 than MDDCs. Human MΦs cultured in M-CSF are deficient in IL-12 production (33). Thus, the deficient IL-12 production of these ΦDCs compared with MDDCs may be attributable in part to an M-CSF effect on the MΦ precursor. If so, then IL-12 secretion by the mature DC may be dictated at the level of the DC precursor cell, which is earlier than at the level of the immature DC as previously reported (34). IFN-γ is a potent Th1-inducing cytokine, which is produced by T cells in response to IL-12 secretion from DCs (35, 36, 37). ΦDCs induced significant T cell proliferation and up to 9-fold more T cell IFN-γ secretion compared with MDDCs, despite producing up to 9-fold less IL-12. They also appear to be Th1 polarizing, as they do not induce significant T cell IL-4 production under these conditions. Neutralization of MDDC IL-12 significantly inhibited T cell IFN-γ induction, but had little effect on ΦDC-induced T cell IFN-γ. Thus, it appeared that IL-12 was not primarily responsible for the potent IFN-γ inducing potential of ΦDCs. β-chemokines may be Th1 polarizing or associated with Th1-polarized immunity in some instances (19, 20, 21, 22, 23, 24), and are DC products (25, 26, 27). Thus we investigated the production of the β-chemokines MIP-1α, -1β, and RANTES, and determined that ΦDCs secreted up to 12-fold more than MDDCs in response to LPS activation. Neutralization of these β-chemokines did not significantly reduce ΦDC-mediated T cell IFN-γ. However, blockade of the β-chemokine receptor CCR5, but not the CXCR4, significantly reduced ΦDC-mediated T cell IFN-γ induction. Anti-CCR5 Ab also reduced the mean fluorescence intensity of IFN-γ in ΦDC-stimulated T cells by 59% compared with only 19% for MDDC-stimulated T lymphocytes (p < 0.01 for the comparison of ΦDCs to MDDCs), demonstrating that IFN-γ production by individual cells was also diminished and suggesting that β-chemokines may also play some role in MDDC-mediated T lymphocyte IFN-γ induction. As MIP-1α, -1β, and RANTES are the only currently known ligands for CCR5 (21), these data strongly suggest that ΦDCs induce T cell IFN-γ at least in part through secretion of β-chemokines, with little or no dependence on IL-12. Inability to inhibit IFN-γ completely through neutralization of β-chemokines likely relates to the enormous quantities of β-chemokines produced in the cultures. These data also represent the first demonstration of IL-12-independent T cell IFN-γ induction by DC1s, and the first T cell IFN-γ induction by DC β-chemokines to our knowledge. However, it is possible that an as yet unknown CCR5 ligand may mediate some of these effects. Furthermore, the specific roles of individual β-chemokines and whether other factors cooperate with β-chemokines in T cell IFN-γ induction by ΦDCs require further investigation, as does determination of the relative efficiency of IL-12 compared with β-chemokines in IFN-γ induction. DC2s, which are not reported to secrete IL-12 (8, 15, 38), likewise induce T cell IFN-γ following viral infection (15). The mechanism of this IFN-γ induction has not yet been reported. Regarding the T cell IFN-γ induced, it may be increased because more cells are producing it, because more is made on a per cell basis, or both. In our analyses of in situ production, ∼130–200% more individual T cells were positive for IFN-γ production when activated by ΦDCs compared with MDDCs, whereas the supernatants collected at the same time contained ∼2- to 9-fold more IFN-γ protein. These data suggest that ΦDCs induced more cells to produce IFN-γ and that more was produced per cell compared with MDDCs. Our data further demonstrate that IFN-γ production is induced by ΦDCs from both CD4+ and CD8+ T lymphocytes. ΦDCs exhibit functional attributes (augmented Ag capture receptor expression; avid pinocytosis; high T cell costimulatory molecule expression; enhanced capacity to activate T cells and induce IFN-γ secretion, little or no IL-12 requirement for IFN-γ induction, and high-level β chemokine secretion), which may be exploited in experimental therapeutics and may be important in vivo. We have confirmed that human in vivo MΦs also differentiate into ΦDCs and share some similarities with ΦDCs derived from in vitro M-CSF-derived MΦs (J. Borvak, W. Zov, A. Gordon, T. Pustilnik, T. Isaeva, and T. Curiel, manuscript in preparation). Their further study merits attention. The functional capabilities and immune-mediating potential of DCs differentiated from distinct precursor cells may differ depending on the precursor cell in addition to the microenvironment. We now show that distinct DC1 precursor cells contribute to differences in DC1 function following their differentiation under identical conditions. This differential functional capacity includes reduced or absent requirements for IL-12 to induce T cell IFN-γ induction, which in the case of ΦDCs appears to be mediated at least in part by β-chemokines (or an as yet unidentified CCR5 ligand). We thank Elizabeth Kraus for excellent technical assistance with flow cytometry. Recombinant human IL-2 was the generous gift of Hoffman-LaRoche. Soluble, recombinant human CD40L was the generous gift of Immunex. ↵1 This work was supported by R01AI39379 and the Baylor Endowment (to T.J.C.). ↵3 Abbreviations used in this paper: DC, dendritic cell; MΦ, macrophage; ΦDC (pronounced “phi DC”), macrophage-derived dendritic cell; M-CSF, macrophage CSF; MDDC, monocyte-derived dendritic cell; SEB, Staphylococcus aureus enterotoxin B; CXCR, CXC chemokine receptor; DR, class II MHC molecule; CD40L, CD40 ligand; MIP, macrophage-inflammatory protein.